Before using the Stratos³ Cube boots in a World Cup race, be sure to weigh them and make sure they are over the 500g (17.64 oz) minimum weight mandated for shells plus dry inners by the International Ski Mountaineering Federation. The smaller sizes with the bikini liner will be cutting it close. Using a KarbonKevlar composite found in top of the line Formula 1 race cars, the Stratos Cube boots are a more durable shell than full carbon fiber boots at an even more shocking weight. If cutting corners to save some money isn't your thing, you might want to check out the latest creation from the La Sportiva team. 100% KarbonKevlar cuff and shell, an ultralight abrasion resistant composite. Patented CavoBike lever is a unique Ergal hinge system that provides stiffness and simple transitions. Special Bikini Cube liner weighs just 80g (2.8oz) and Velcros snugly around your foot and calf. Unique closure buckle has three macro settings with a dynamic cable for micro-regulation. Optional rear spoiler included (+20g) to add a bit of stack height in the rear. 5 forward lean positions from 5° to 19° lock into a receiving notch that doesn't contact the composite material. Special bushing system prevents abrasion between cuff and shell during rotation. Crampon compatible with an adjustable ring in the rear to get an exact fit. Thin Vibram sole uses an anti-abrasion compound in the toe and heel for extra durability. Zippered gaiter with adjustable inner straps protect your liners and socks from water while being easy to get in and out of. Removeable Warm Sole sock liner adds some insulation while allowing for volume customization. Notes Special composite is more durable that carbon fiber. Bottom Line Lightest ski mountaineering boot in the world. Let me start off by saying these things are ridiculously light, 590g light (mondo 27). Charging uphill seriously feels like running shoes. The combination of ankle articulation and lack of weight allows for extremely efficient uphill travel. The ski to walk mechanism was redesigned after the the somewhat primitive mechanism of the Stratos Evo. Simply flip the upper buckle and the cuff is pulled tight and the walk-ski bar falls into place. 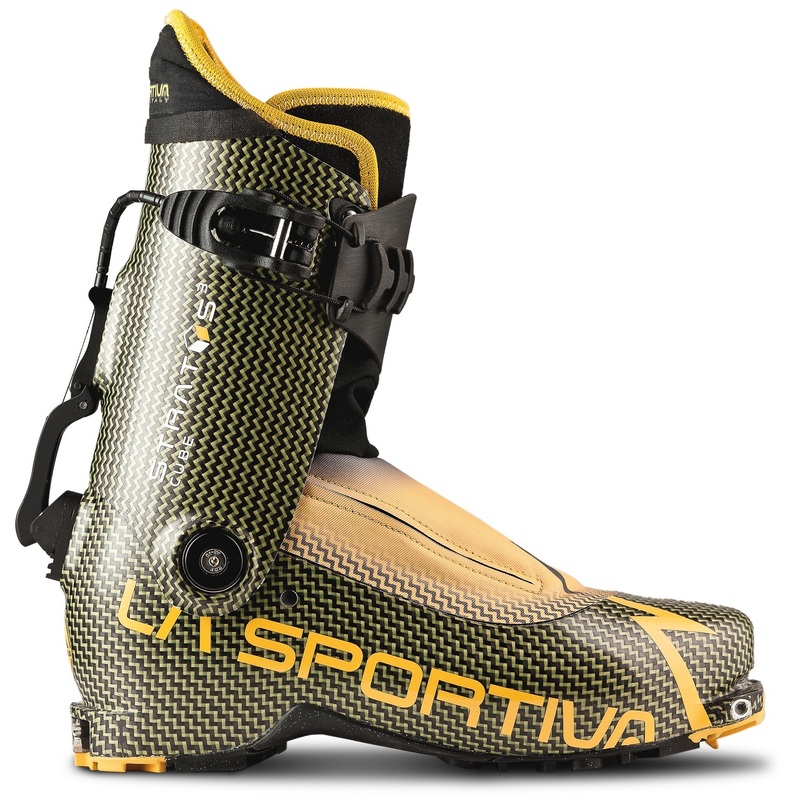 This is quite a nice update that La Sportiva has started implementing on many of their boots. Long term durability is the issue, the carbon, despite the additional kevlar weave scratches and cracks easily on rocks. Shown is a carbon repair where the fiber above the cuff pivot failed altogether and the upper completely detached from the lower. La Sportiva seems to have cut weight by only laying up two layers of low weight fabric for the upper cuff, and this is the root of the problem. A bit of sanding and carbon tow overlaid with stringers has solved the problem, and the repair is still holding after some aggressive skiing. The real question is how they perform on the down. I continue to be surprised by how well race boots can ski for their weight, full composite construction lends stiffness despite the lack of material. Rearward flex is extraordinary, but the boot struggles in forward flex. You will find yourself skiing in the chair skimo racers so often find themselves seated in. I have recently switched to Alien 3.0s, had this is why I'm giving this boots a negative review. Both boots are similarly priced but the 3.0s absolutely blow the Stratos away in terms of skiability and construction. Comparing the two pairs, the Stratos has a much lower quality construction, I believe that the composite factory for this boot was located in China. While the 3.0s have the Italian, hand made quality I would expect. I wear a 26.5 for the Dynafit PDG and they fit great. What size would you recommend for these? Hi Patrick, this boot had a wider toebox, narrower midfoot, and an overall lower volume than the PDG does. Generally, if a 26.5 fits you in the PDG then that's your size in most other race boots but the internal shape will differ quite a bit and thus how well they fit. I'd love to do a side by side comparison but this boot was discontinued a while back, so it's no longer available in the most common sizes. Hi Tom, it depends on your fit in the Aliens. If you're a very tight fit then yes you'd likely need to go up to 26.5/27 because the carbon boots cannot be punched. A looser fit and you'd have a good chance to get in the 26.0. The sole length is not a great way to precisely determine internal length. Can the lower shells of the stratos be fitted? I'm guessing not, but am still curious. Hey Joey, full carbon boots aren't workable in the same way as plastic ones. I'm not going to say impossible but it's certainly a big challenge.